"A fun, clever simulation and interesting use of AGS. No real gameplay to speak of though." This is a very nice experience, way better than what I expected. This is simply amazing! One of the most relaxing things I've ever seen done with AGS. I couldn't stop watching the pixels spread, die and spread again last night. I was completely fascinated. At first i thought getting a balance on a small island would be hard to achieve but your algorhithm is really sophisticated, it's as if nature itself readjusts the balance. 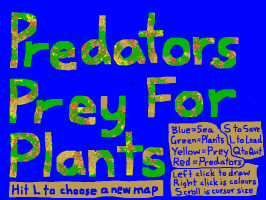 At the moment I am waiting for the carnivores to get over a small path to an island where herbivores are eating the plants but never get to fully let them extinct. This invasion seems to take a lot of cycles. - I thought about temperature changes and how the animals could get over water in very cold moments of the simulation and die out in very hot moments, that could also shrink the water areas. This is such an interesting idea. 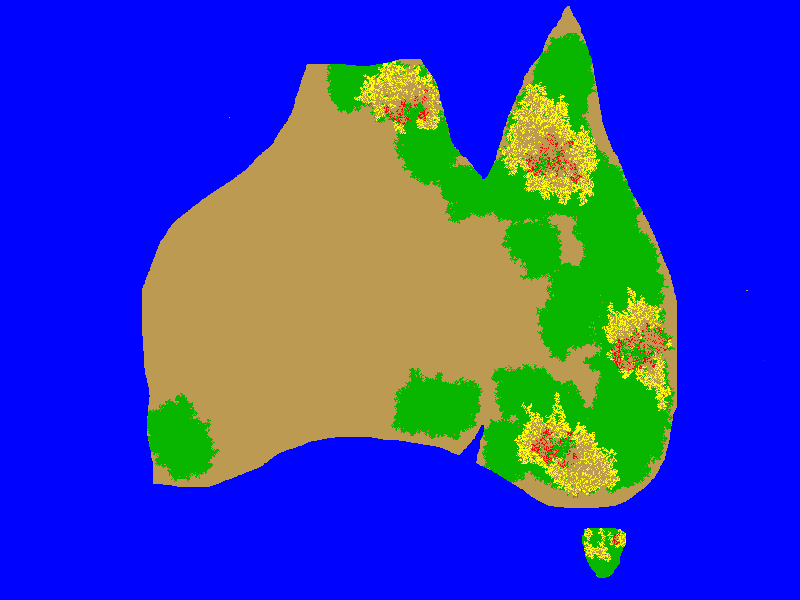 It's intriguing to watch the different colours spreading across the map and see how they interact with the environment. There is no actual gameplay, but it is a very innovative concept! A cool little concept and technically impressive, though seeing the game sweep and re-draw the map is a bit jarring in my opinion. My guess is that the engine just can't quite handle re-drawing the screen so fast? Sadly it's not much of a game in it's current state, so while impressive as a technical feat, it's not very engaging over longer periods of time. What I feel it lacking is the ability to create something unexpected and unique like in the "game of life", something that behaves unexpectedly and suddenly transforms the map in some way. As I will be away until the end of the month on a summer camp with students this is my last chance to release the game in time for the MAGS deadline. 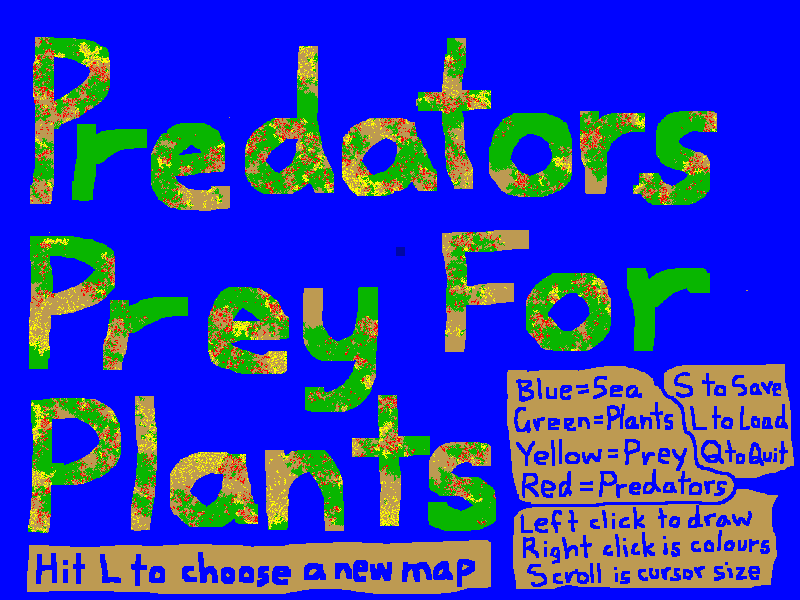 As it stands it is a real-time interactive simulation/sandbox of the predator/prey/plants relationship. The interface might be a tad confusing, so please read the above instructions or the READ ME in the game folder. But once understood I think the controls should be pretty easy to use. May your packs, herds, and forests thrive, and avoid extinction!